If the ribs have the membrane skin on the back, remove it. Combine the salt, pepper, smoked paprika, garlic powder and onion powder in a small bowl, stir to combine. Top both sides of the ribs with the dry rub, and rub in. Place the trivet inside your Instant Pot. Pour in 1 cup of water. Stand the ribs upright inside, so the bones are vertical. My ButcherBox ribs come pre-cut in half. If you have a full rack, you can curve it around to fit inside or cut them smaller. Close with the lid. Make sure the vent is in the sealed position. Cook on manual pressure for 25 minutes. Naturally release pressure for 15 minutes, then do a quick release. After the 25 minutes, preheat your oven on broil. Line a rimmed baking sheet with aluminum foil. Place the ribs on the baking sheet. Brush with BBQ sauce. Remove from the oven, and allow to cool for 5 minutes. Slice the ribs and serve. If making this ahead, store the ribs after cooking them in the instant pot. Right before serving, brush with BBQ sauce then broil. You can fit in up to 3 racks of ribs in a 6 quart Instant Pot. No need to adjust the time. 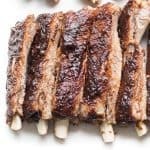 You can cook the ribs in the instant pot from frozen. Increase the cook time to 35 minutes. But you’ll want to make sure the ribs are already cut to the right size before freezing, since they won’t bend to fit when frozen. And you don’t want the cut ribs stuck to each other in a big block, since they won’t cook evenly.